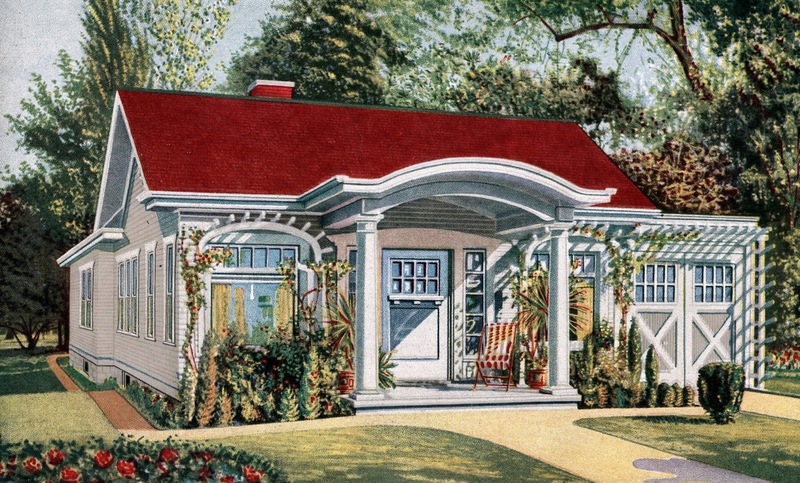 The Sears Ardara was a Colonial Bungalow with an "artistic" porch and trellises. First sold in 1919, the Ardara actually offered an attached garage as an option--I believe this was the earliest Sears model to do so. This Ardara in Elmhurst is an authentic Sears house--previous owners found shipping labels on a window frame. The trellises are not original, but reproductions. There has been a sensitive addition to the house--barely visible from the front. The original owners were Paul and Blanche Ferguson. He was a carpenter for the Chicago and Northwestern Railroad, so putting up a Sears house would have been no trouble for him. I have not seen one Sears house that I do not like. Big or small they are all beautiful. Only heard of them recently. After researching how they were built & learned of some of the materials that were used, I am even more enthralled with them. I have never seen one that I know of, but I am going to look now. In my opinion Sears & Roebuck Co. is to be admired.